Hat styles varied among southern Yup’ik villages, from simple circular caps to elaborate hoods with fringes and tails. The differences allowed a person’s place of origin to be easily identified by observers. On Nunivak Island men and boys wore fancy hoods like this one during the Messenger Feast and Bladder Festival. 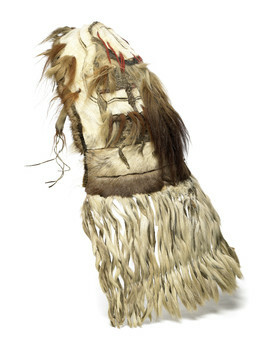 It is made of white and brown caribou fur, spotted Arctic ground squirrel pelts, a wolverine tail, and small wolverine tassels. The long tassels at the bottom are caribou. Aron Crowell: So, could we talk first of all, what all these different furs are? John Phillip, Sr.: Wolverine-am terikanira-am pamyua. John Phillip, Sr.: Qanganaat. Canek-im squirrel-anek pilaqait? Joan Hamilton: Ground squirrel, qanganaat. Aron Crowell: Okay, so this is reindeer, ground squirrel, and wolverine tail. How about these little tassels here? Joan Hamilton: Tungulria cauga [What is the black part]? Nena Rivers: Wallu-qaa tengmiam tukullekai? . . . Qugyuut tukullgitneng pingqetulriit. Kenugucitulriit. Qugyuut tukullrit amiirluki tungulria. John Phillip, Sr.: Ii-i. Meqcirat-ll’, atak tuaten ilait ayuqelallrulriit nayiit, issurit-llu. Qeciit tuaten tunguluteng. Nena Rivers: Looks like qugyuk [swan]. Qugyuum tukullrim pikaa tauna. John Phillip, Sr.: Mengtutatii cuqeqnganateng-wa itgaita qeciita. Nena Rivers: I think that’s the kind they use only to make it look fancier. Virginia Minock: The white part, that’s colored. Neva Rivers: The ones that were kept, were kept for a long time. . . Maybe by the time they are going to sell them they tinted it. Joan Hamilton: With natural colors. John Phillip, Sr.: Tuntuviit [moose] . . . . Caribou-at allaugut, reindeer-at tuntut . . . . Caribou-t tuntuyagarnek pilarait augkut . . . Tuntupiatun ayuq . . . tuntupianek pilaryaqut, qanlaryaaqut taugaam wii cauciitelaranka . . . . Caucingeksaitanka niitnaraaqa. Taugaam ukut wani-w’ tuntut caribou-t nallunritanka ayuqenritut. Joan Hamilton: Qangvaq taugaam Nunivamun ayautellruatki? Akaurcessiyaallrunrituq. Imumi tuntut anguyaggarluki tamani pillruyukluki? Wallu-q’ civuani tuntungqellruut? John Phillip, Sr.: Maaten ellangua tuntutarluni. Aron Crowell: Who would wear this? Is this for a man or a woman? Virginia Minock: Angutem-w’ pillikii. Nunivaarmiut-wa nallukeput. John Phillip, Sr.: Makuciturluteng wani Nunivaarmiut tekitelallruut kiagungraan, angutet. Joan Hamilton: Angayuqaungameng-qaa pilallruut? Wallu-q’ tamalk . . . piciatun-qaa aturyuumaluki? (They did that because they were the leaders? Or did all … anyone was able to wear them? John Phillip, Sr.: Nalqigcesscigatanka Nunivaarmiunguvkenii tua wii wani-wa. Piciatun kiuyumiitua wiinga. Joan Hamilton: Kina tua ilumun tua, kina tua uumeng, makucimeng aturluni tekiskan una tangerrluku camiungullra nallunricaran. John Phillip, Sr.: Ii-i. Taugaam taktuaneng wani tangeqsaitellruunga taktalrianek taugaam nanillritnek. Neva Rivers: Maybe this was supposed to be for the dressing up for dancing, or something—celebrating. Joan Hamilton: It’s possible . . . When you look at it, it looks like it would get in the way of mobility. So, automatically you think its for some kind ceremonial use. Because, like [John] said, they wore shorter ones, [that were] functional. . . . And it’s the same thing with the placement of the decorations, its family and regional distinctions. Joan Hamilton: Cayarturluteng tekitlallruat? Naverniarluteng? . . . Caneng naverniarluteng? Joan Hamilton: Ii-i [yes], walrus flippers. Coastal food that’s not readily available upriver. Aron Crowell: So they’d be bringing that from Nunivak and what would they be taking home? John Phillip, Sr.: Trade-arluteng. Wagguq [ ] akluteng pilallrukait neqaullrutaitnek iliini. . . Taugken iliini akinek akinek trade-arluteng piaqluteng akikartangellrani. . . .
akirarnun ilait tamakut uqut, putukuat-ll’ imkut naverutaqluki. Tuaten ayuqellruut. Joan Hamilton: Putukuat [their feet]. Oh, ii-i [yes]. It was more with trading food and clothing. Later on, money. . . G.od, it’s so beautiful. Cuna-w’ waten pitullrulriakut tangerrsugnaqelrianeng. . . . Mana tau-g tangraqamki cuna-w’ tau niitlalriaten maani artwork. Tuaten tava tangraqamki makut umyuateqnaurtua. According to the Yup’ik Eskimo Dictionary, meqciraq—singular of meqcirat—means “skin soaked so that the hair will come off,” a process often referred to as “aging” a skin.